This recipe for Roasted Italian potatoes and onions is just delicious. The onions are crispy on the outside and have a lovely flavor and texture when you bite into them. 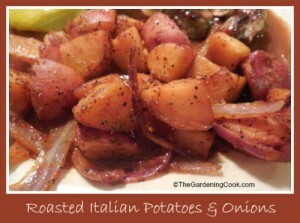 Roasted Italian Potatoes and Onions – A Delicious Side Dish. This recipe is super easy to do. 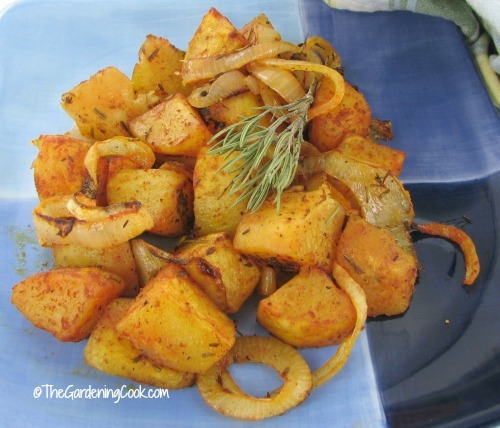 The potatoes and onions take on a really delicious flavor with a mix of fresh rosemary and thyme combined with paprika. Making this recipe gave me a chance to try out a new brand of Sweet Smoked Spanish Paprika from one of my sponsors – Kiva. (affiliate link) Their paprika gave the potatoes a wonderful smokey flavor that is amazing. Even smelling the jar made me think of hickory smoke. It really is delightful. The recipe is super easy to do. The potatoes are first mixed with this lovely sweet smoked paprika in a bowl with some olive oil. Next place the herbs on the bottom of the roasting pan. I used a silicone baking sheet. It makes clean up easier later. Then slice the onions and place them on top of the herbs. Finally, add the potatoes and paprika and drizzle with a bit more oil. I love that the potatoes and onions are cooked on top of the fresh herbs, and then everything gets mixed together at serving time, and this infuses them with the flavor of the herbs. 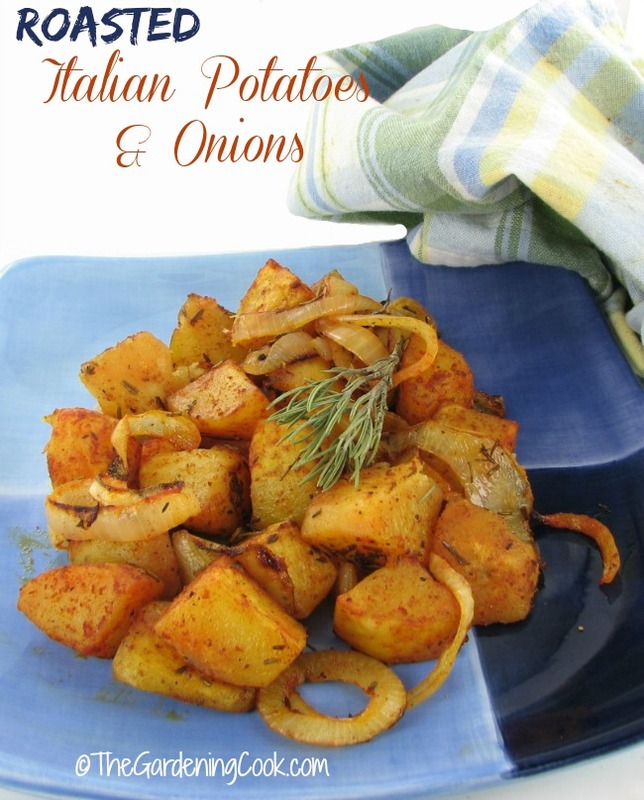 These roasted Italian Potatoes and onions are a perfect side dish for any protein course or also a great main dish for vegans or vegetarians. The potatoes are so full of flavor, and roasting brings out the sweetness of the onions. The paprika and fresh herbs make a wonderful flavor profile that really adds to the taste. We loved them.! I served these potatoes with my seasoned grilled pork chops and they went perfectly together. NOTE: I received a jar of Sweet smoked paprika for free in exchange for including a link to the product in my recipe. I only recommend a product if I believe it will be useful for my readers. This one is great! For another great international side dish, try these Italian sweet potatoes. They are YUM! 1 tsp cracked black pepper. Position a rack in the center of the oven and heat the oven to 450°F. Spray pam on a large baking sheet. In a medium bowl, toss the potatoes and paprika with the olive oil and 1 tsp. of the salt to coat. Spread the thyme and rosemary on the baking sheet. Add the onion slices over the herbs, and then place with the potatoes, cut side down. Pour over any olive oil remaining in the bowl over the potatoes. Roast until the potatoes are tender and brown on the edges, 30 to 35 minutes. 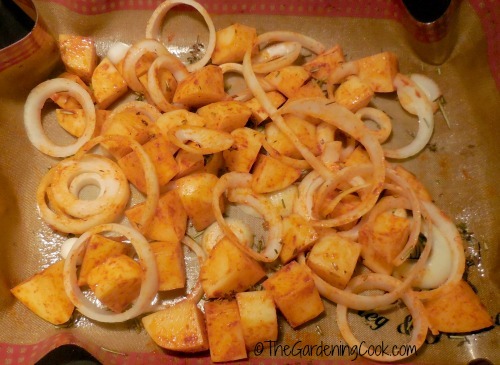 Transfer the potatoes and onions to a bowl and toss with the cooked herbs. Season to taste with Kosher salt and serve. This sounds l8ke it would be extremely good. Can’t wait to try this. Thank you for sharing the recipe.